Although paid streaming subscriptions have continued to grow at a steady rate, the far more rapid decline of paid downloads, along with CD sales suggests that streaming services need to grow their paying subscriber base at an even greater rate. As rapidly as the music business is moving to paid streaming subscriptions from paid downloads there’s an argument to be made that it needs to move even faster. At the MusicBiz conference in May of this year we offered up a somewhat dire forecast for US digital download revenues, suggesting that more than half the buyers would evaporate by 2020. That’s a bundle of lost revenue, as the RIAA estimated 2015 sales of $2.3 B. Revisiting that forecast we’re starting to think it could be worse. About a week ago Billboard reported the lowest tally of download sales for a #1 song in ten years. “Closer” by The Chainsmokers sold 84,000 downloads in the week ending October 27. The article pointed out this was the fourth occasion this year that a #1 sold fewer than 100,000 downloads in a week and highlighted Nielsen Music’s trend of a 25 percent decline in digital song sales. However, the sales data tells only part of a troubling story. Even as Americans bought fewer CDs we continued to listen to them. CD revenues fell 52 percent between 2011 and 2015 (RIAA), yet the percent of people who listened remained reasonably steady at a few points above 50 percent. As recently as Q3 2016 MusicWatch’s audiocensussm monthly tracking survey shows that 52% of the internet population listened to a CD in the past three months. This shouldn’t be surprising. We listen to a lot of music in our cars, most cars still have CD players, and for many it has been, and remains, more convenient to pop in a disc than connect to a digital option. The trend in how we listen suggests that many Americans never fell entirely out of love with CDs even as they moved on to streaming. The trend for digital downloads suggests that is not what’s happening with song files. There is a simple explanation. Downloads share the same device profile as streaming; the laptop and the smartphone. This makes them streaming and downloads more interchangeable Nearly nine out of ten digital download listeners are also streaming music, at least one hour per week. Music purchases and listening habits are regularly monitored by MusicWatch’s audiocensussm tracking. 1. 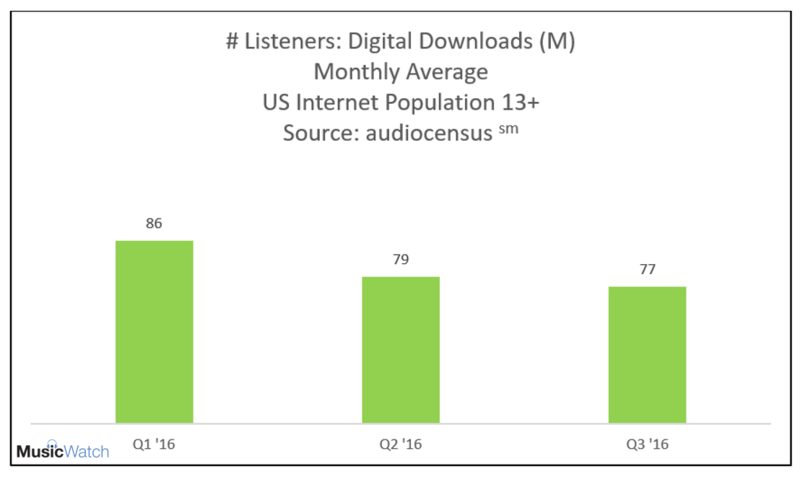 As of the close of Q3 2016 audicensussm indicates that there are now nine million fewer download listeners in the US than at the beginning of the year (end Q1). As shown below, the number of people listening to downloads has gone from 86 million in an average month to 77 million. Now, 77 million is still a lot, and maybe some had a hangover after listening to all those Adele downloads, but we don’t think so. Among the remaining 77 million listeners, the time spent per week is slipping but only slightly—down about three percent to 7.9 hours per week. But remember—nine million went from something to nothing, meaning the average is actually down to 7.0 hours. That’s actually a 14 percent decline in time spent listening. Scarier still is the behavior of heavier download buyers. Among the 41 percent who bought more than three songs per month, time spent listening to downloads is off 14 percent—and their time spent music streaming is up by a whopping 18 percent. That’s a lot of numbers. Translated it means that, if the trend holds, downloads are losing listeners at a rapid pace at the same time engagement (time spent listening) among core download customers is shifting to streaming. Nielsen’s 25 percent decline could just be a preview of things to come. What’s next? The number of streamers who pay for a music subscription in 2016 will be double the 2015 count. That’s terrific but even more aggressive and creative actions must be taken to grow the franchise for paid subscriptions. Only about 1 in 3 paid downloaders also pay for a subscription. Apple and Amazon sold the overwhelming majority of downloads, and they have the ultimate relationship with most of these buyers—an account backed by a credit card. If those download buyers haven’t yet taken a free trial to Apple Music or Amazon Music Unlimited, then offer them one—repeatedly and vigorously. Streaming is the future however there are still over 30 million download buyers in the US. Today on the iTunes store there are pre-orders for the new Bruno Mars album, a feature for the deluxe version of Lady Gaga’s “Joanne” and a discounted version ($.69) of Kelsea Ballerini’s “Peter Pan,” fresh off its CMA performance. As the download stores become less of a weekly destination, we can’t ignore those who have any inclination to buy a track or album. These specials should be promoted as energetically as Spotify hypes new playlists. No paying downloader should be left behind. 1Research note: In addition to the cited RIAA figures, certain historic data is sourced from MusicWatch’s Music Acquisition Monitor. MusicWatch’s audiocensus is a monthly consumer survey conducted online and projected to the internet population 13 and older. Certain figures are based on respondents who listen for at least one hour per week. Could Interactive Artist Subscriptions Bridge The Album Gap?